I'm a huge fan of Food Network Magazine. Have you read it? I love it for so many reasons. 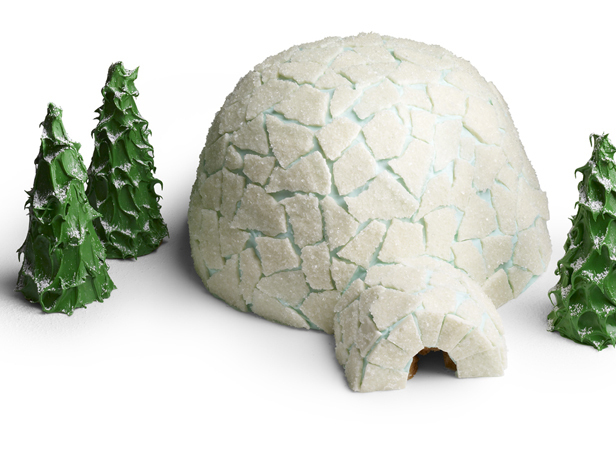 In the most recent issue, they have instructions on how to make this PRECIOUS Igloo cake! The best part about this cake is that is looks so easy that anyone could do it! And the trees? Ice Cream cones! This is perfect for those Winter ONEderland parties! 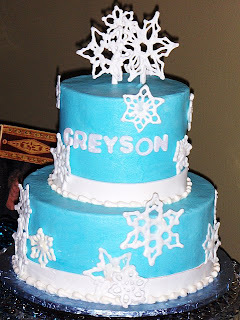 Speaking of winter parties, this igloo cake made me think of one of my baby showers for Grey which was a winter theme, since it was held in January. I loved the idea of turqouise and snowflakes! Ths fabulous cake was made by Cakes by Mom and Me in West Memphis, Arkansas. And, it was my favorite flavor---lemon! How cool is that igloo cake?! So neat! That igloo cake is too cute!! Wow, these cake crafters are getting more & more creative!